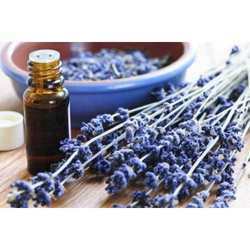 We are one of the leading supplier of Lavender Oil in India. We make use of the essential properties of lavender by extracting the oil from the lavender flowers. This is a clear to yellowish liquid which caries mesmerizing fragrance. Due to its relaxing and soothing effect, this oil is used for treating various skin problems, itching and skin irritation. This oil is also effective for stress, insomnia, shock, vertigo, sunburn, burns, cuts, insect bite and muscular aches. We offer this oil in various sized bottles and pack them with tamperproof packaging. Looking for Diffuser & Wick Oil ?